Having grown up with horror films and slasher thrillers, this generation could presumably be too desensitized for horror apps to have an effect. Horror, as a genre, has generally been reduced to blood and gore, a rather crude departure from the rich history of haunted adventures and ghostly whispers. So what chance does a game played on a small LED screen have? Quite a good one, as it turns out! "Limbo" is a black and white 2-dimensional game about a boy in a dangerous forest teaming with giant spiders and assorted deathtraps. The basic gameplay involves the boy walking through the forest, facing deadly obstacles and trying not to get killed. Naturally, he does, over and over. Fortunately he can respawn, allowing the player infinite chances to figure the puzzle out. With clean graphics and a rich but subtle soundtrack, "Limbo" is remarkably fun to play, with its fair share of graphic death. Twisted and morbid, sure. Scary? Not quite. Hugely popular among Android users, "Five Nights at Freddy’s" is a game about possessed animatronics. The player’s vantage point is that of a security guard keeps watch over weirdly creepy toys. When his back is turned, the toys come after him. Despite the chilling special effects, "Five Nights at Freddy’s" relies on jump-scares to deliver the chills, neglecting any real story. You get over it once you’ve had a few of them, at which point the game becomes tedious. "The game graphics are not really good, and the gameplay becomes very boring," second year Computer Science graduate student Harshit Shah said. "Actions are limited, and not that scary either. It is very childish." "Dead Trigger" is a first-person shooter (FPS) game, the goal being to escape from a horde of zombies. With a basic plot line of the zombie apocalypse variety, "Dead Trigger" is fiercely graphic without any particular fear factor. Though the zombies come in various shapes and forms, there is no real element of fear, but rather the staple blood rush of FPS games. Like "Dead Trigger," "Into The Dead" is an FPS game centered on a zombie apocalypse. However, it has the added element of being a line-runner as well, which basically simplifies the plot line: dodge zombie-obstacles in your path, picking up weapons along the way. 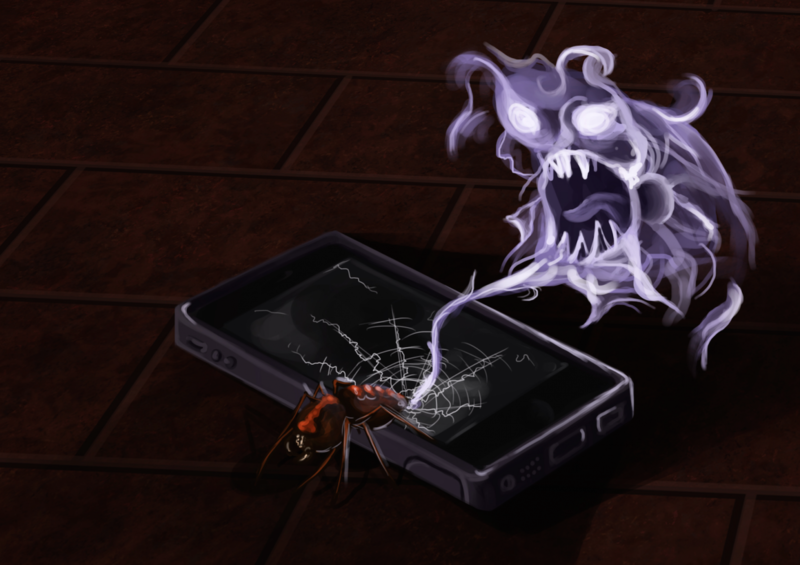 Currently the most popular haunted world game on Android, "Into The Dead" has rich graphics and an awesome soundtrack, but, like "Dead Trigger," it doesn’t really scare. "The only really scary bit about the game are the sound effects, and even that's a little funny once you get used to it," first year Mechanical Engineering graduate student Umesh Sojitra observed. "The gameplay is decently difficult, but it is more adventurous than scary." "Eyes – The Horror Game"
"Eyes" is a first-person explorer game, in which the player must explore a haunted environment by collecting resources while trying to escape from floating spirits. With graphics that resemble night-vision, "Eyes" would be nostalgic for players familiar with "Paranormal Activity." However, before a spirit arrives a warning to run appears on the screen which causes "Eyes" to lose a little of its substantial fear factor. "The music gives you the creeps, but the gameplay is confusing at times. The general VFX are mediocre, but the ghost encounters are particularly chilling," Sojitra said. From one of the earliest horror game series on Android, "Slendrina: The Cellar" is a first-person explorer game quite similar to "Eyes." "The graphics lack richness of detail and depth, but that's the only negative. The sound effects are good, the gameplay is difficult and the ghosts are really scary. It gives you the goosebumps," Shah said. "Slendrina" is a closed first-person point of view explorer game in which players must walk through a cellar looking for keys that will aid their escape. Unlike "Eyes," however, "Slendrina" has no warnings, and with the limited vision of the player, it packs an incredible amount of fear into tiny little jump-scares. With a soft haunted soundtrack during regular play, "Slendrina" uses audio effects to push the chills to the limit, with every sighting of "Slendrina" accentuated by a sharp shift in the audio track. And that is why, despite being the shortest of the games on this list, "Slendrina" is by far the scariest, with a consistent and relentless capacity to scare the living daylights out of any player. Or at least shake them up a little.